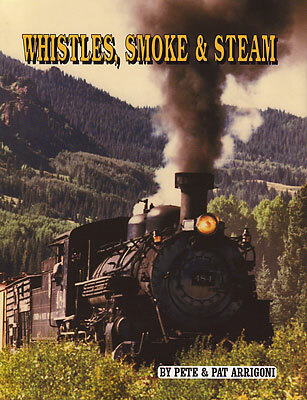 WHISTLES, SMOKE & STEAM gives entertaining accounts of Pete and Pat Arrigoni's train adventures around the world, trips their readers can duplicate. These railroad trips include riding on narrow, standard and broad gauge tracks pulled by both diesel and steam locomotives. All the trains in this book are still running and welcome passengers to ride them. Part One of the book describes "Trains Offering Public Transportation" in both foreign travel and the United States. Part Two includes "Train Excursions and Tourist Rides, plus Oslo, Norway’s Airport Express; Bergen, Norway Floibanen Funicular Railway; and San Francisco’s Cable Cars." Each of the thirty-three chapters includes web and Email addresses so the reader can duplicate the same trips. WHISTLES, SMOKE & STEAM has stunning color photographs throughout, plus a six page index. Remember that I asked you to autograph [Whistles, Smoke and Steam] for "Wayne"? Wayne is my 85-year-old uncle. I knew that he loved trains because his entire basement is covered with a model railroad layout. What I didn't know was that he and my aunt took a 3-month train holiday through the United States in the '70's and rode many of the same trains you did. I sent the book to him as soon as I got it from you, and last Saturday he called to tell me that he had not been able to set it down since it arrived...He thinks it is a beautiful, well-done book, and the added benefit was that it brought back wonderful memories of his own travels with my aunt...."
WATCH THE PROMOTIONAL TRAILER FOR WHISTLES, SMOKE AND STEAM! Pat Arrigoni is a travel writer, book author, newspaper columnist, and photographer. Her books have included a guide on Marin County, California titled Making the Most of Marin; a children’s book, Harpo, the Baby Harp Seal; and a novel made into a two hour movie-of-the-week by Ted Turner. Her travel writing has been published in newspapers and magazines throughout the United States and syndicated by Gannett News Service and Copley News Service. Pat graduated from Dominican University in San Rafael, California with a BA degree in English/Art/American Literature. Pete Arrigoni, a stockbroker for twenty years, is now retired from the job as manager of the Marin Builders Association where he worked for twenty-six years. He was elected to the Fairfax City Council, served as mayor, and was elected to the Marin County Board of Supervisors for two four-year terms. He also served on many boards and commissions, including the Golden Gate Bridge Highway and Transportation District as well as the Bay Area Air Pollution Control District. He was chairman of the Marin Community Foundation and currently serves on the Marin County Retirement Board. Pete attended the College of Marin, then joined the United States Coast Guard and served in the Pacific from 1952-1955. In 1956, he was drafted by the San Francisco 49ers to play professional football after playing at the University of Arizona in Tucson. He graduated with a Bachelor of Science Degree. Pete and Pat Arrigoni have two adult children, James and Robert. Their love of rail travel has resulted in a collaboration of this book, Whistles, Smoke and Steam, and is the outcome of their many railroad trips together. Copyright �2001-2014 Travel Publishers International, Inc. All rights reserved.